A focused Strategic Research Program requires R&D priorities defined by the involved industries in cooperation with leading academic institution and harmonized both on a national, as well as on an a European level. EICOSE is instrumental in achieving this in the area of processes and methods for complex safety critical systems in the transportation domain. 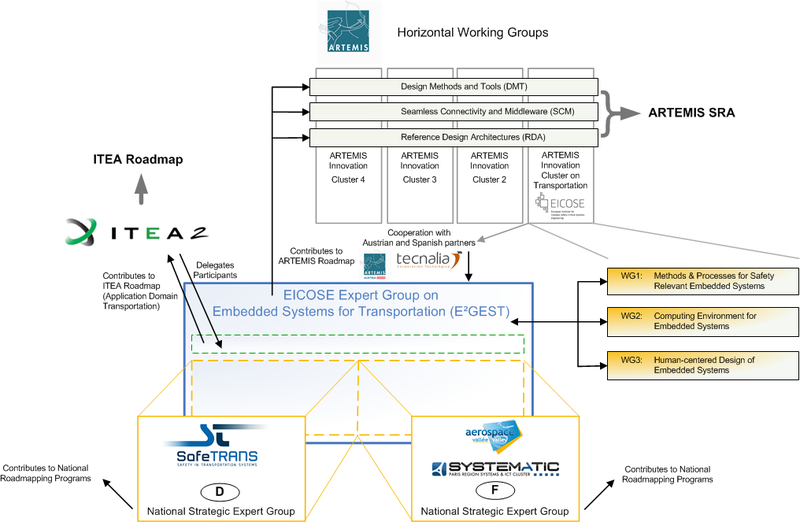 EICOSE has installed five theme-oriented working groups for identification of research challenges, priorities and approaches within their scope, as well as E²GEST (EICOSE Expert Group on Embedded Systems for Transportation), which combines representatives from EICOSE working groups, EICOSE clusters and other leading European industiral and academic experts of ARTEMIS organizations to define and harmonize R&D themes, prioritizing them and provide input to national and European funding programs, such as ARTEMIS and ITEA. In this way, EICOSE has contributed to three out of eight subprograms in the 1st Call for Project Proposals of the ARTEMIS Joint Undertaking.